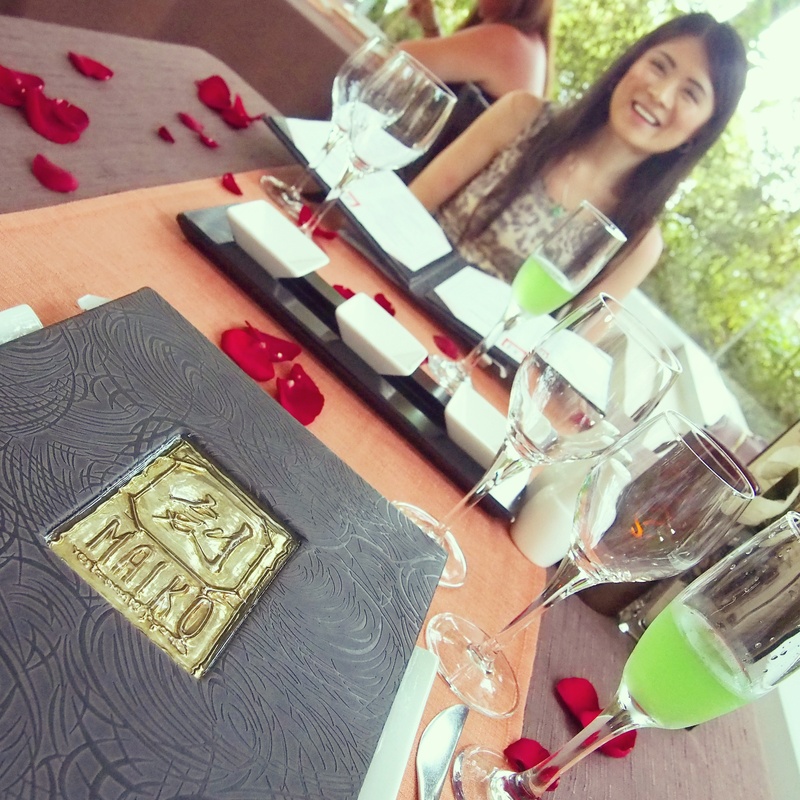 Our One-Year Anniversary Dinner at Maiko Japanese Restaurant (in Luxury Bahia Principe Sian Ka’an)! 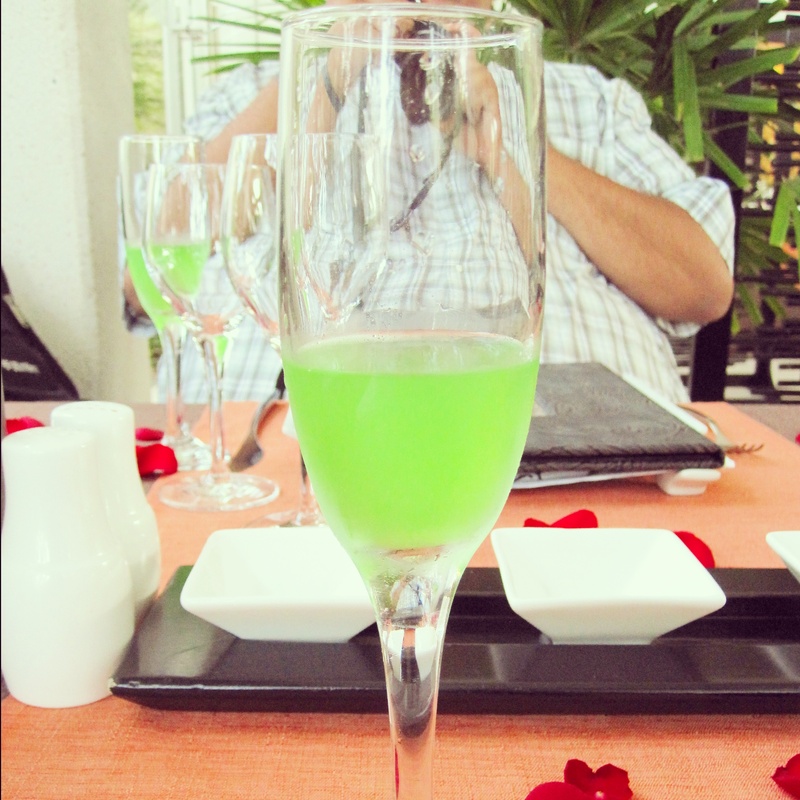 Maiko was my favourite restaurant at the Bahia Principe Riviera Maya! 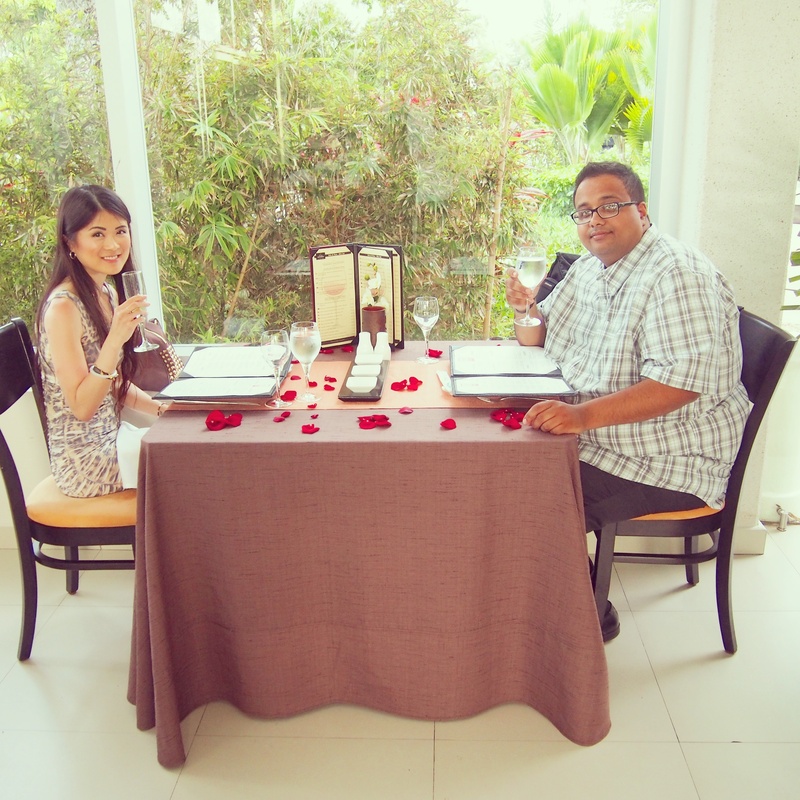 When Raj made the dinner reservation, he informed them that it was our one-year anniversary celebratory dinner. 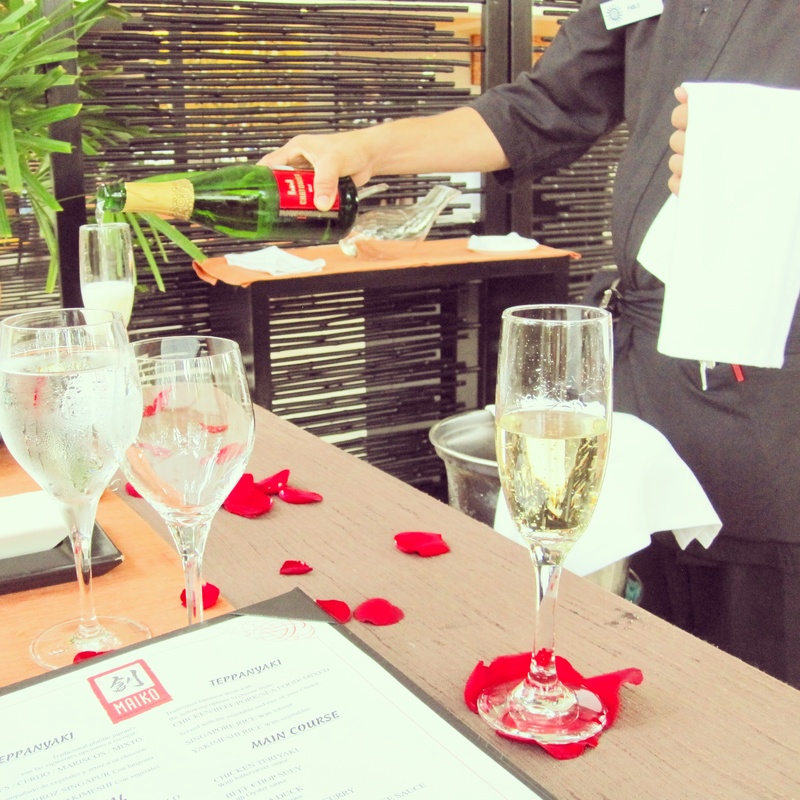 When we arrived, they surprised us with the best window seats in the restaurant and rose petals all over our table! What fabulous service! We were definitely impressed. They also surprised us with a complimentary bottle of sparkling white wine! This Chatonier Brut sparkling white wine from Spain, which was only 10% alcohol, tasted drier than what I normally prefer, but it was not too dry for me. It arrived chilled in an ice bucket and our server popped open the bottle for us. What a nice, festive surprise! Thank you, Maiko! 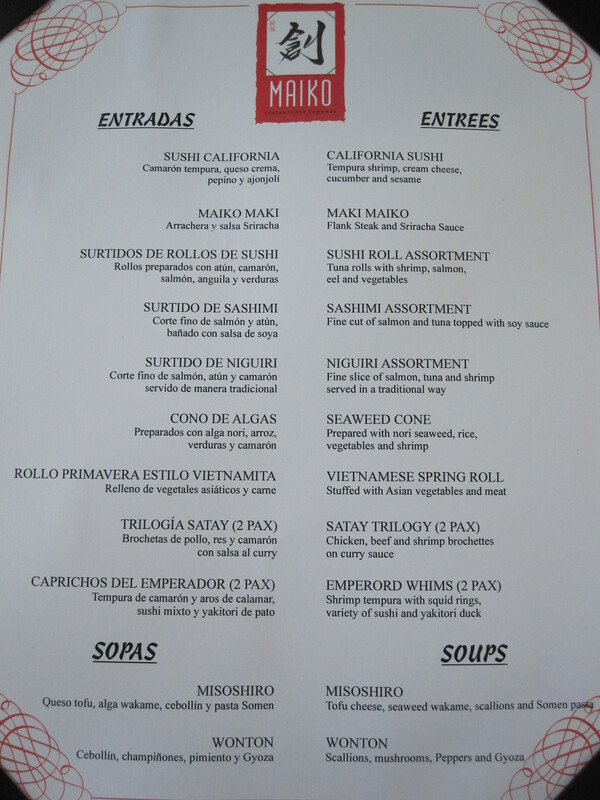 I was so excited to look at their menu and see what kind of Japanese cuisine would be offered at a Japanese restaurant in Mexico. I was distracted for a bit by all the beautifully scattered rose petals on our table. Ha ha ha. Before we could open our menu, we were surprised once again with a complimentary apéritif. This cocktail was called “Shanghai” and it was THE BEST cocktail we had on the trip! 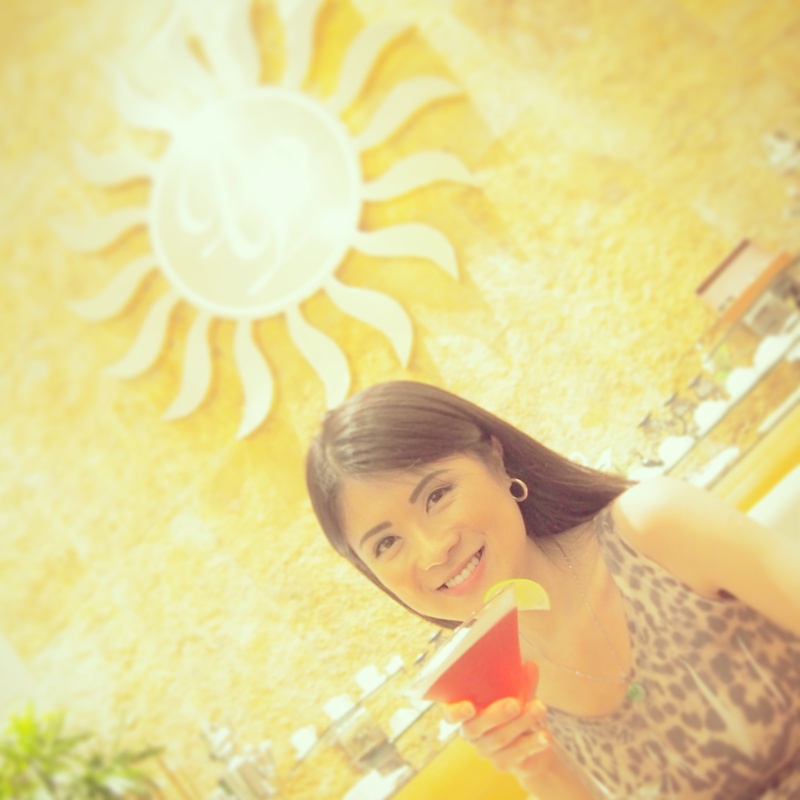 Unfortunately, no other bar on the resort managed to recreate this cocktail exactly during the remainder of our trip. 😦 This cocktail tasted like a delightful blend of tropical fruit juices in your mouth. We absolutely loved it! Before any food came out, we were each given this assortment of condiments to accompany all our savoury courses. 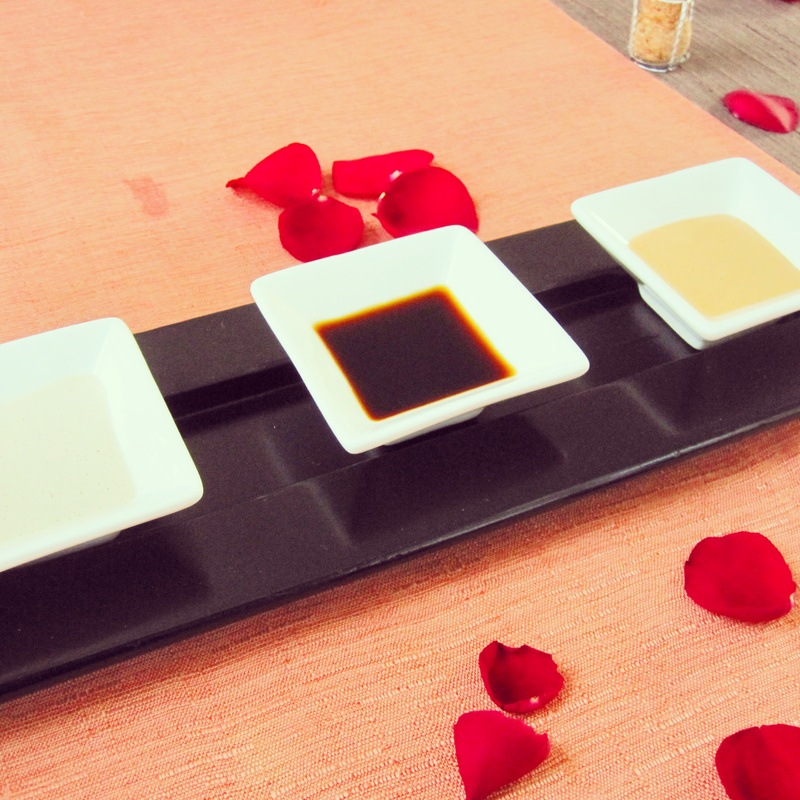 From left to right: a sweet sesame sauce, soy sauce, and a spicy mayonnaise sauce. The sweet sesame sauce tasted like a lightly sweetened tahini sauce and it was my hands-down favourite of all three condiments! I added some to every course except dessert. 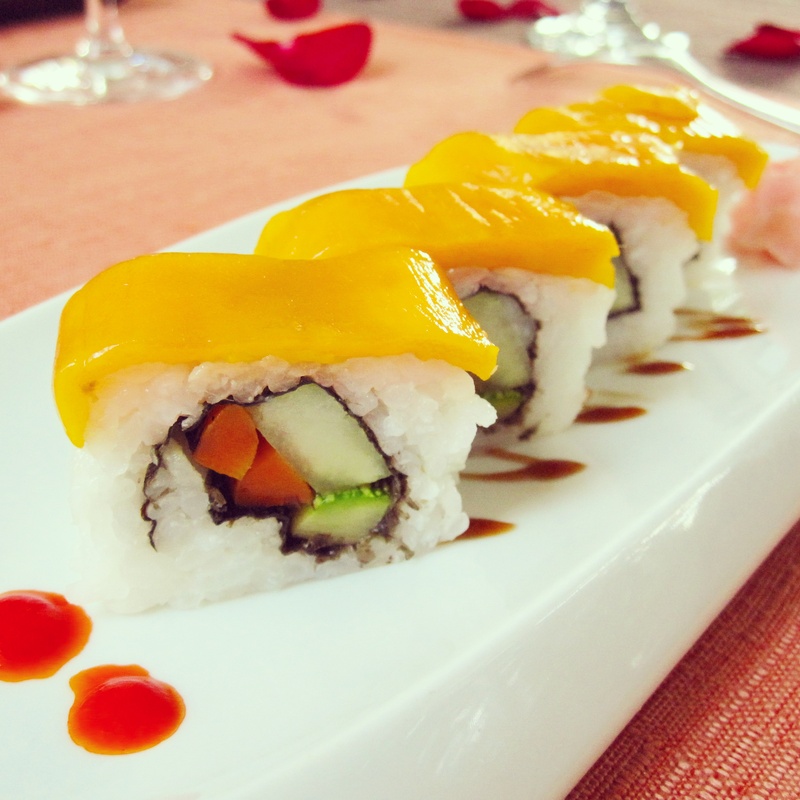 The soy sauce was definitely sushi-grade and not the lower quality cooking-grade. The spicy mayonnaise sauce was just a mixture of Sriracha chili sauce and mayonnaise, so it was not anything unique or spectacular. 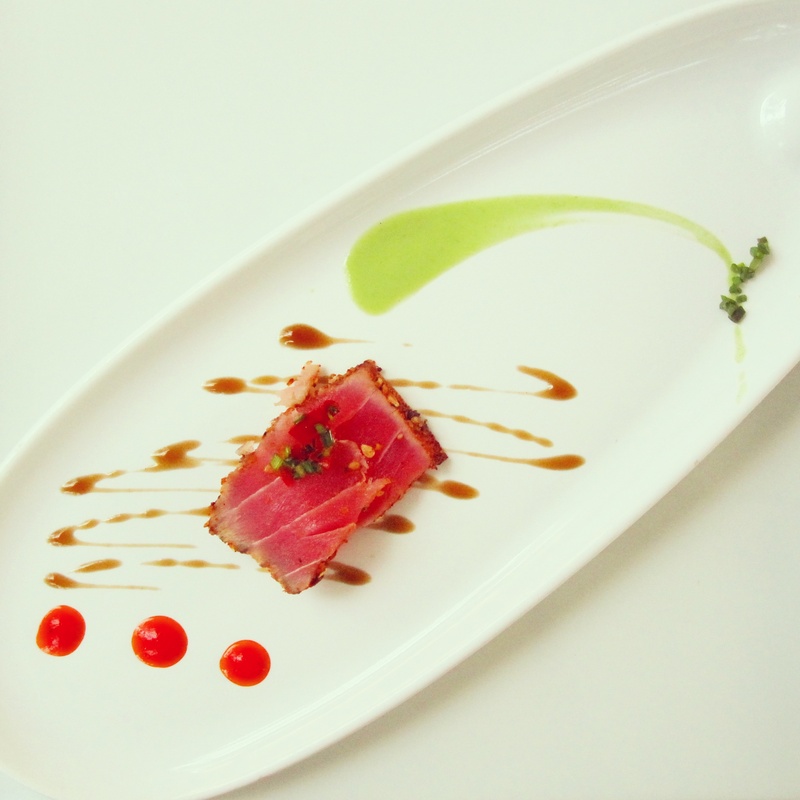 After placing our orders from the menu, they surprised us yet again with a complimentary amuse-bouche. I loved this palate teaser! These thin, bite-sized slices of tuna steak were seared to perfection (thin cooked crust on the outside, but still completely raw on the inside). The outer cooked crust was so flavourful and it tasted like it was seasoned with shichimi tōgarashi (the Japanese seven-flavour chili pepper spice mixture). The tuna was so fresh and not fishy at all. Also, the presentation was beautiful! I am not sure what the three drizzled sauces were, but when you coat the tuna slices in all three sauces and then put them in your mouth, it was such a wonderfully balanced mixture of salty, sweet, and spicy flavours! For the first course, I ordered a vegan version of the “California Sushi”. I am not vegan by any means, but that was what I felt like having that night. So instead of having “tempura shrimp, cream cheese, cucumber, and sesame” in my maki roll, they just put fresh cucumber and blanched carrots in my roll and then they topped it off with thin mango slices. As a self-proclaimed “sushi snob”, this does not make my top-five-vegan-maki-rolls list, but it was definitely better than what I was expecting for sushi in Mexico. I enjoyed the nice balance of sweet and savoury flavours in this roll, which I had with soy sauce and the sweet sesame sauce, of course. “Misoshiro Soup – with tofu cheese, seaweed wakame, scallions, and Somen pasta.” The “tofu cheese” was just plain tofu pieces and completely dairy-free. 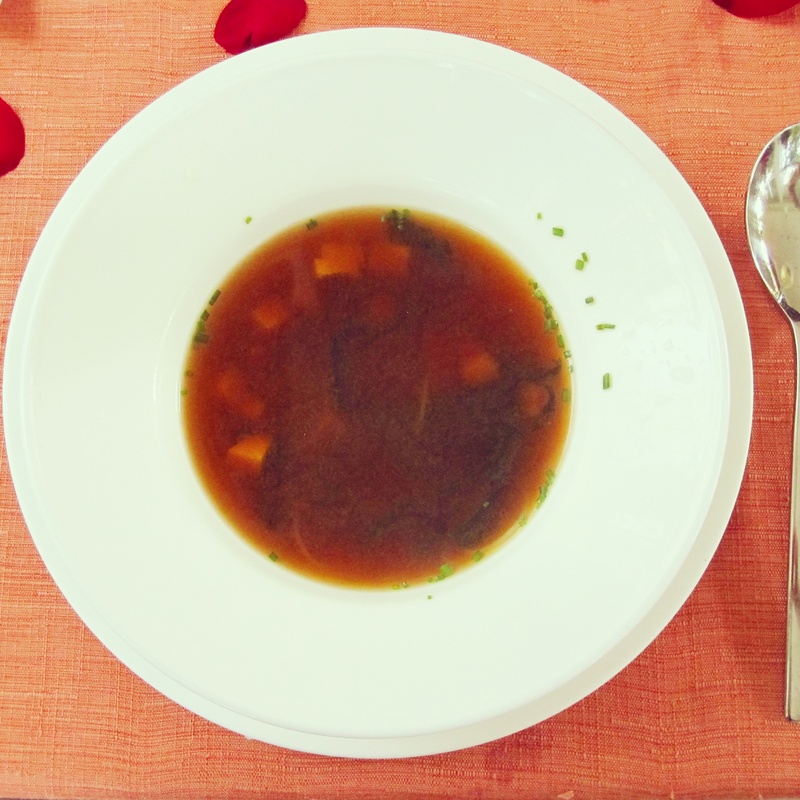 This miso soup was not anything spectacular, but it was good. It was not too salty and contained a good amount of tofu pieces and seaweed. I was glad that there were only a few strands of Somen noodles, because that kept this dish nice and light for an appetizer. 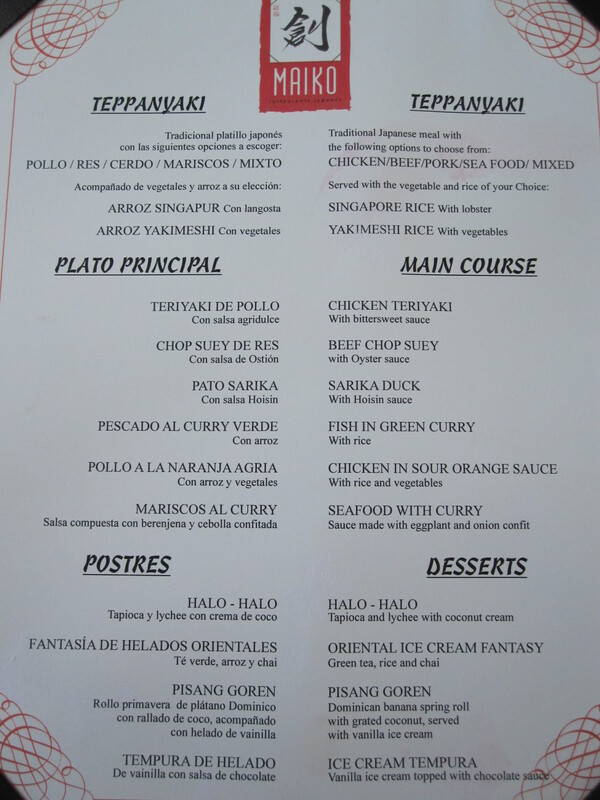 The menu for the teppanyaki, main course, and dessert. You could order a teppanyaki dish along with your main course before dessert, but Raj and I opted to order just a main course and dessert since we did not want to overindulge. 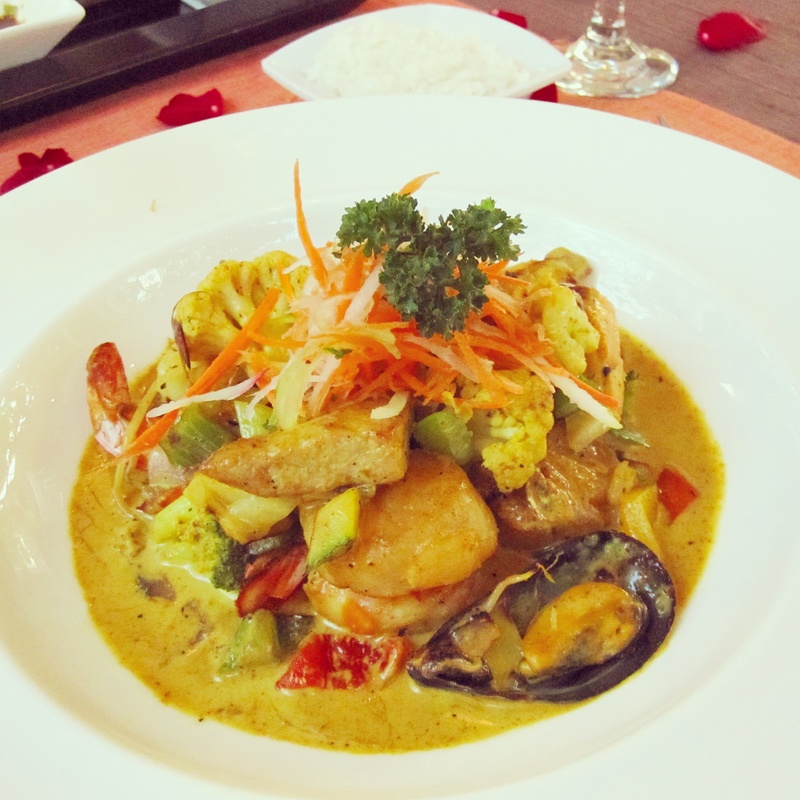 “Seafood with Curry – sauce made with eggplant and onion confit.” My main course was absolutely delicious! The coconut-milk-based curry sauce was so creamy and flavourful. Also, there was a generous amount of seafood (mussel, shrimp, scallop, fish, etc.) and it was all so fresh! This seafood curry was served with a small bowl of short-grain white rice and the rice was perfectly cooked. My only criticism is that I wish this dish was spicy, because I like my curries quite spicy! I would reorder this dish as is though. It was just so aromatic and tasty! “Halo-halo – tapioca and lychee with coconut cream.” Halo-halo is a Filipino dessert that is mainly shaved ice and evaporated milk topped off with fruits, sweetened boiled beans, jello, and/or other sweets. That was what I was expecting, but instead, this halo-halo was more like a Thai coconut tapioca pudding. 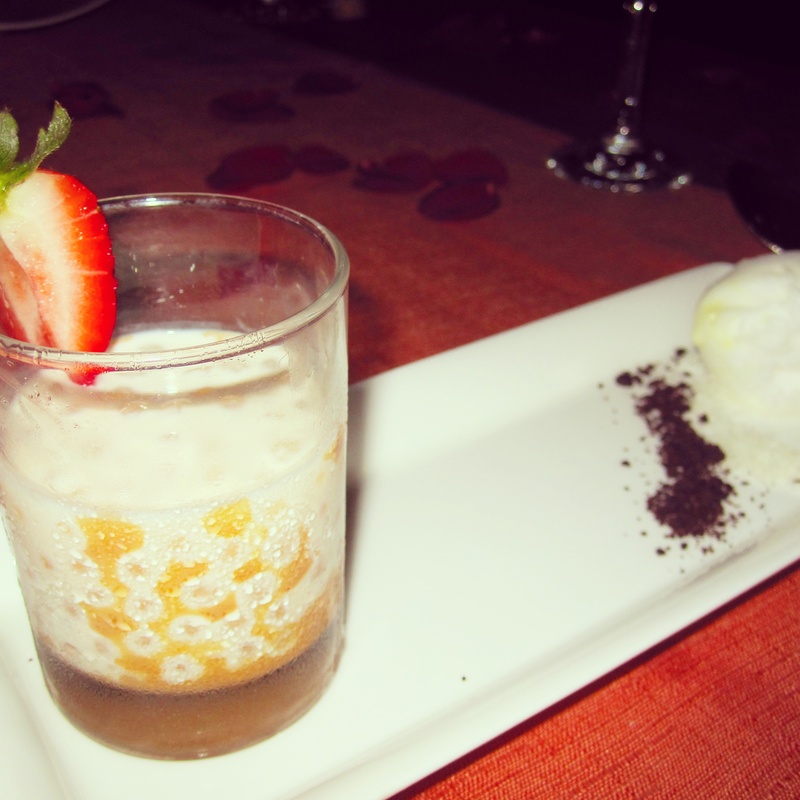 This dessert was mainly made of small tapioca pearls that were suspended in thick, sweetened coconut milk. I could not taste any lychee. Although this was not your traditional Filipino halo-halo, I enjoyed this gluten-free dessert, especially with the scoop of coconut ice cream on the side. I ended up having only a small bite or two of that halo-halo dessert since I wanted to save my sweet-tooth splurge for the Sian Ka’an bar lounge next door. It is all about moderation. At the Sian Ka’an bar lounge, I channeled my inner Carrie Bradshaw and ended my fabulous night with a Cosmopolitan and some dancing. What a fun night! If you are visiting the Bahia Principe Riviera Maya resort and are at least 18 years of age with no kids (or have someone to babysit the kids), I highly recommend having dinner at Maiko and then hitting the Sian Ka’an bar lounge afterwards for post-dinner drinks. This night out was definitely the highlight of the trip for me. Thank you, Maiko (and Sian Ka’an)!